After September 11th, the sign board became a way for suburban America to express solidarity. All down any given highway you could see hundreds of small storefronts asking us to pray for the victims, to support our troops, and in some cases crying out for vengeance. For some reason, I was transfixed by this. Something about the grass-roots nature of it moved me. I’m kicking myself for not taking more photos of them at the time. Several years later, this has mostly died down, but occasionally there’s someone who still uses this medium in a particularly attention grabbing way; here’s one of them. 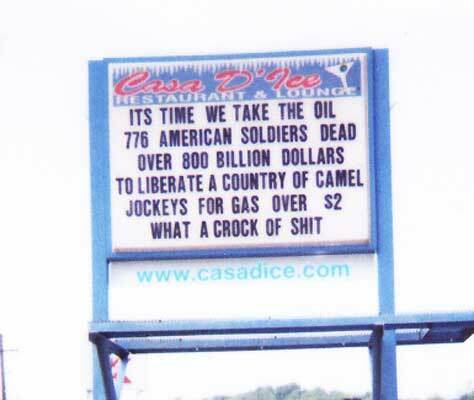 I meant to take a picture of this sign a few weeks ago, when it had a provocative rant about Iraq and gas prices. But before I remembered to bring my camera when passing it, it had changed to something less interesting. 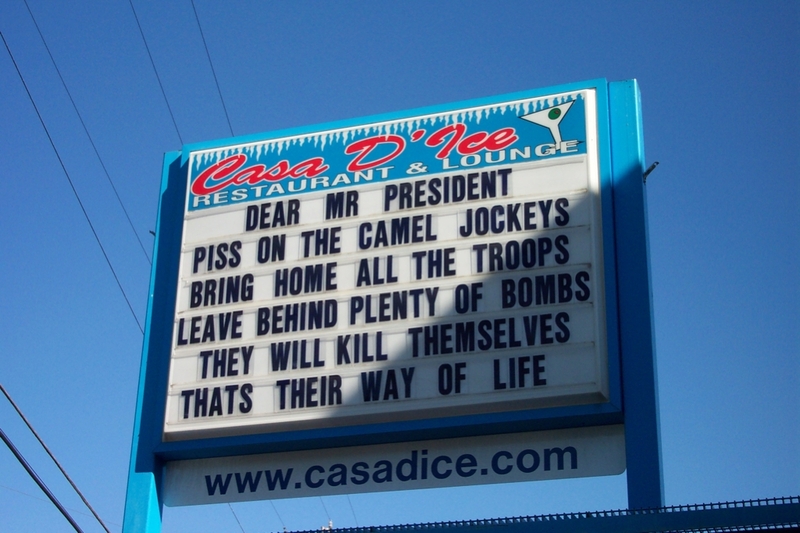 Fortunately, this week’s return of the phrase “camel jockey” makes it worth sharing. It’s an interesting sentiment, and I think it is representative of the fundamental split between our leadership and their base. Unlike the justified and measured retribution the US engaged in in Afghanistan, the Iraq war is unquestionably an imperial adventure. By this I mean that it is an enterprise that is of no demonstrable present value to the United States (it may give some benefit to the Iraqis themselves, or to the Kurds, or to history, or give some unquantified future value to the US), although it certainly has involved incredible cost in both blood and treasure. Patriotic Americans, by and large, understood exactly the trade off involved in the Afghanistan war, and understood the motivation. No one – at least, no one unwilling to use the word “empire” – has provided sufficient justification for the Iraq war that is both reasonable and truthful. Imperial ambitions, of the very sort that George Washington warned us about, are destructive to a Republic. By its very nature the act of taking and holding territory incurs expenses that are unimagined otherwise. Furthermore, the more territory that one has to defend, the more thinly spread one’s resources become. The British didn’t just abandon their empire out of niceness, but out of necessity: it was bankrupting them. I don’t see any particular reason that the same fate won’t befall this latest American flirtation with imperialism. I found the sign that originally struck me on the restaurant’s web site, so I have reproduced it here. While it’s easy to focus on the hate and rage being projected at the Iraqis, there is a subtext of confusion and anger at our own government here: Why are we there? What are we gaining? What’s the point? The Bush administration has so far steadfastly ignored these sorts of commonsense questions from the public. I hope that the electorate responds appropriately to that disrespect in November. The restaurant where these signs stand has proudly posted pictures of previous messages on their web site, here.